El Niño winters tend to be warmer and drier than average. El Niño’s climatic counterpart, La Niña, is characterized by cooler, wetter winters than average. Warm phase PDO winters tend to be warmer and drier than average. Cool phase PDO winters tend to be cooler and wetter than average. When the two events are in-phase (El Niño and warm phase PDO or La Niña and cool phase PDO), the potential for temperature and precipitation extremes increases. These well-established effects of the major modes of climate variability in the PNW have predictable consequences for water resources in the region on seasonal to decadal time scales. 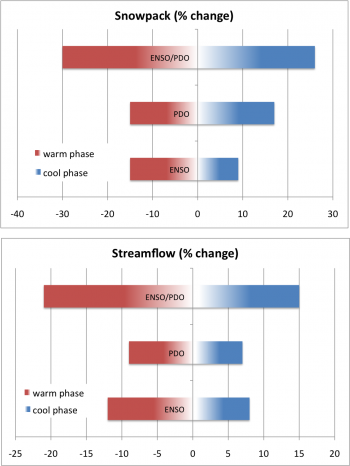 The effects of ENSO and PDO can be expressed as percent changes from normal winter snow depth and summer streamflow. Figure 1 indicates that El Niño and/or warm PDO winters tend to have lower than average snowpack and streamflow. The reverse is true for La Niña and/or cool PDO. Figure 1. Impacts of ENSO and PDO on snowpack (top) at Snoqualmie Pass, Washington, and on streamflow (bottom) at the Columbia River at The Dalles. Averages are computed during the warm phases (red) and cool phases (blue) of ENSO and PDO separately and combined (in phase). These well-known connections between the two main drivers of natural variability and PNW climate and hydrology have noticeable consequences for regional resources that are associated with water. The table below summarizes a few of the key impacts attributed to the different phases of regional variability. The combined effects of climate change and climate variability in the Pacific Northwest are expected to result in a wide range of impacts for the region’s communities, economy, and natural systems. These include projected changes in water resources, forests, species and ecosystems, oceans and coasts, infrastructure, agriculture, and human health. Washington’s water resources will be affected by projected declines in snowpack, increasing stream temperatures, decreasing summer minimum streamflows, and widespread changes in streamflow timing and flood risk. These changes increase the potential for more frequent summer water shortages in some basins (e.g., the Yakima basin) and for some water uses (e.g., irrigated agriculture or instream flow management), particularly in fully allocated watersheds with little management flexibility. Changes in water management to alleviate impacts on one sector, such as hydropower production, irrigation or municipal supply, or instream flows for fish, could exacerbate impacts on other sectors. 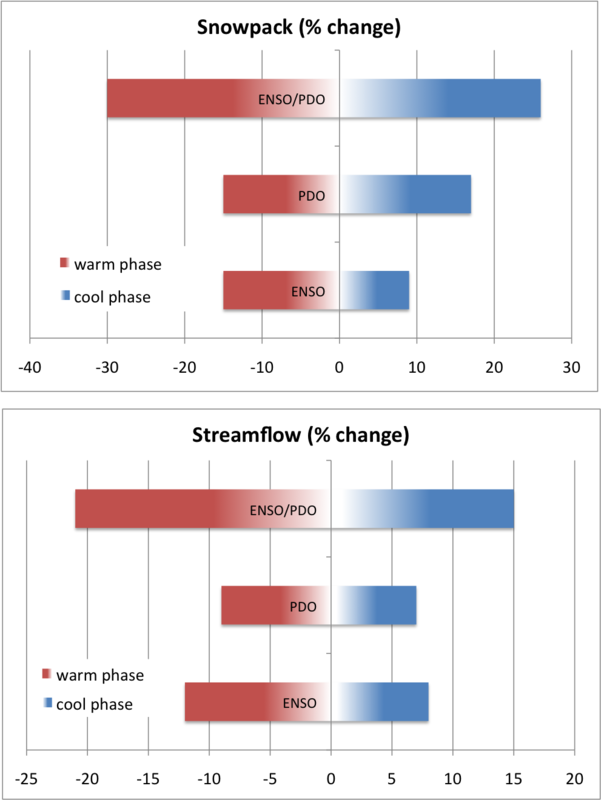 Impacts of ENSO and PDO on (a) snowpack and (b) streamflow at specific locations in the PNW. Average total winter snow depth is shown for the winter season (January 15 to April 15) at Snoqualmie Pass, Washington. Streamflow is for April-September average flow on the Columbia River at The Dalles after removing the effects of the dams on streamflow. Averages are computed during the warm phases (white) and cool phases (black) of ENSO and PDO separately and combined. Note the cumulative effect when ENSO and PDO are in-phase (i.e., El Niño and warm phase PDO, La Niña and cool phase PDO). Percent changes from normal winter snow depth and summer streamflow associated with ENSO and PDO show that El Niño and/or warm PDO winters tend to have lower than average snowpack and streamflow. The reverse is true for La Niña and/or cool PDO. Washington’s forests are likely to experience significant changes in the establishment, growth, and distribution of tree species as a result of increasing temperatures, declining snowpack, and changes in soil moisture. A rise in forest mortality is also expected due to increasing wildfire, insect outbreaks, and diseases. The projected changes could affect both the spatial distribution and overall productivity of many ecologically and economically important Pacific Northwest tree species, including Douglas-fir, ponderosa pine, lodgepole pine, and whitebark pine. Areas of suitable climate for many plants and animals are projected to shift considerably by the end of the 21st century. Many species may be unable to move fast enough to keep up, resulting in local species losses and changes in the composition of plant and animal communities. Challenges are expected for many federally-listed endangered and threatened species dependent on coldwater habitat, including salmon, trout, and steelhead. Projected impacts on other habitat types in Washington State, including wetlands, sagebrush-steppe, prairies, alpine tundra and subalpine habitats, would affect species dependent on those habitats. Sea level is projected to rise in most areas of the state, increasing the likelihood for permanent inundation of low-lying areas, higher tidal and storm surge reach, flooding, erosion, and changes and loss of habitat. Sea level rise, rising coastal ocean temperatures, and ocean acidification will also affect the geographical range, abundance, and diversity of Pacific Coast marine species. These include key components of the marine food web (phytoplankton and zooplankton) as well as juvenile Chinook salmon and commercially important species such as Pacific mackerel, Pacific hake, oysters, mussels, English sole, and yellowtail rockfish. Climate change can make today’s extreme events more common. For example, two feet of sea level rise in Olympia could turn today’s 100-year flood into an annual event. Climate change is expected to affect the longevity and performance of built infrastructure in Washington State. Most climate change impacts are likely to increase the potential for damage and service disruptions, although some risks (such as snow-related highway maintenance and closures) may decrease. Higher operating costs and reduced asset life are also expected. Sea level rise and increased river flooding are important causes of impacts on infrastructure located near the coast or current floodplains. Washington crops and livestock will be affected by climate change via increasing temperatures and water stress, declining availability of irrigation water, rising atmospheric carbon dioxide, and changing pressures from pests, weeds, and pathogens. Some impacts on agriculture may be beneficial while others may lead to losses – the consequences will be different for different cropping systems and locations. While impacts on some locations and subsectors may be significant, most agricultural systems are highly adaptable. As a result, the overall vulnerability of Washington’s agricultural sector to climate change is expected to be low. However, given the combination of increasing water demands and decreasing supply in summer, water stress will continue to be a key vulnerability going forward. Climate change is expected to affect both the physical and mental health of Washington’s residents by altering the frequency, duration, or intensity of climate-related hazards to which individuals and communities are exposed. Health impacts include higher rates of heat-related illnesses (e.g., heat exhaustion and stroke); respiratory illnesses (e.g., allergies, asthma); vector-, water-, and food-borne diseases; and mental health stress (e.g., depression, anxiety). These impacts can lead to increased absences from schools and work, emergency room visits, hospitalizations, and deaths.